Our family has been eating the pizza at Joe's Pizza and Subs for almost 18 years. Wowzas! It all started with pizza days at Bayshore Public. I remember the school always ordered extra pizza and students and teachers would be able to walk down by the gym and buy some slices of pizza. Pretty cool idea. My favourite thing about Joe’s Pizza is their sauce. Lucy and I used to love the giant bubbles in the crust, but we haven’t been lucky enough to get pizzas with them lately. After checking out the small farmers’ market at Bayshore, Andrew and I were hungry for lunch. We weighed our options in the car: food court food, Indian lunch buffet, shawarmas, Tim Hortons, or Joe’s (as we like to call it). We decided we’d pick up some pizza, buy some drinks, and head over to Britannia Beach to eat. 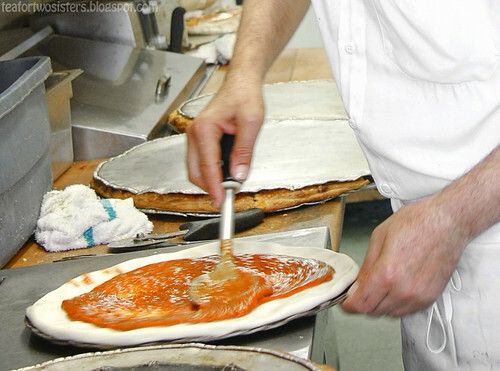 The friendly owner, Sam, gave me permission to take some photos of him masterfully making our two pizzas. Their sauce used to be so dreamy! I feel like their sauce is saltier and less herby than I remember. It’s still good, mind you. Bacon, pineapple and extra sauce. Sam then topped it with cheese and tossed it into the oven to bake. At the beach, we found a nice shaded area and sat on the grass. Grandma commented, “If I had known we were coming here, I would've brought a hammock!” I would’ve brought a blanket or something to sit on, but that didn’t matter. Dad, Andrew, Grandma and I all liked the bacon and pineapple pizza even though the toppings slid around. The sour and sweet pineapples broke up the salty bacon and sauce real well. The chicken and onion pizza, it was good but the flavours didn’t jump out. 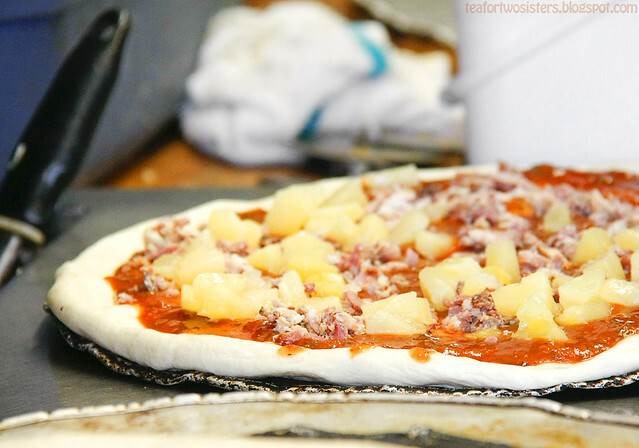 If there was some pineapple and bacon on the pizza, it would’ve tasted amazing! It’s a bit weird saying that. 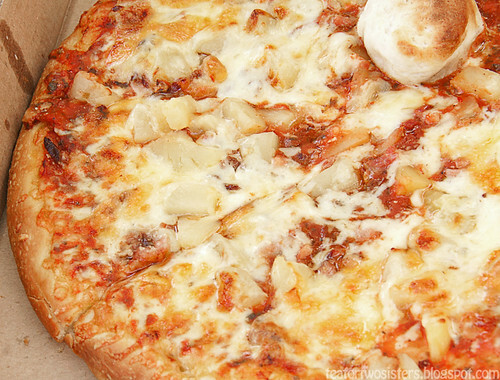 I used to revolt Hawaiian pizzas because of the pineapples. As we savoured every bite of the two pizzas, a couple seagulls stood nearby and tried to beg for food. We didn't feed them of course. After we ate and sat back, Grandma amused herself by tossing little pebbles and branches towards the seagulls. She laughed when they fought over what they thought was food. I think this was the first time I saw Grandma troll. That explains a lot. Both Mom's side and Dad's side like to troll! The golden slightly blistered buttery crumb crust was so fragrant. Do you see the dark cheese cooked on the crust? Love it. The pizza was really well made. I expected nothing less from Sam. Sometime in April, Lucy and I were craving something greasy. Joe's came up in our discussion. We didn't get to enjoy much of Joe's pizza when the Aussie's came to visit. So we called Joe’s and ordered two pizzas. We picked up the pizzas and then went to buy drinks at Bayshore. I don't know why we didn't just buy them at Joe's. This pepperoni and bacon pizza was really salty. 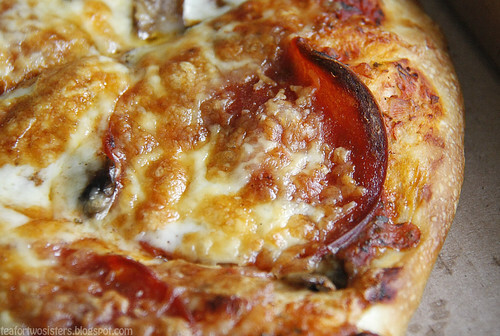 How about some pepperoni and mushroom pizza? I actually don’t mind the mushrooms, although the larger clumps are still off-putting. You can't tell how large these slices actually are. They're quite substantial. You can probably eat two or three slices of Pizza Pizza pizza for every large slice of Joe's pizza. And that's the average slice. If you get one of the humongous pizza slice, unevenly cut, then you probably won't need to eat another slice. I totally forgot about the crispy pepperoni edges! How could I forget? I remember watching the teacher opening the boxes of pepperoni pizza and seeing dough bubbles and crispy pepperoni edges. And the smell: Joe’s pizza and moist cardboard boxes (the boxes of pizzas were stacked on one another and somewhat steamed). If Mom was in a good mood, she’d send me to school with a can of pop on pizza days. My little elementary self struggled to finish a can of pop and slice of Joe’s pizza. I remember hearing the pop slosh around my stomach during recess. I found it so amusing. As I write this, I’ve come to realize that Joe’s pizza has become my standard of good greasy pizza. The pepperoni pizzas of my Bayshore Public days have been ingrained into my food memory: fragrant crisp crust with a bit of cheese baked on, good sauce, pepperoni with crispy edges, and golden processed cheese. I think I prefer the fluffy breadier pizza dough at Lorenzos than the richer crumb crust at Joe’s though. 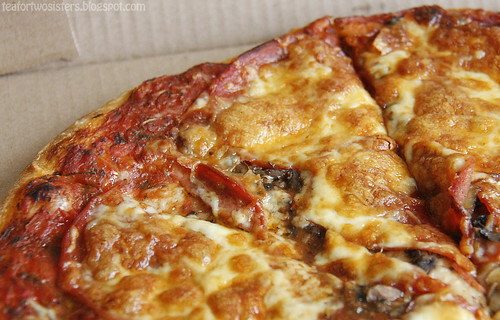 While I like Neapolitan pizza (see Pizzeria Libretto), sometimes I just crave a greasy Ottawa/Lebanese-style pizza made from Joe’s Pizza or Lorenzos. 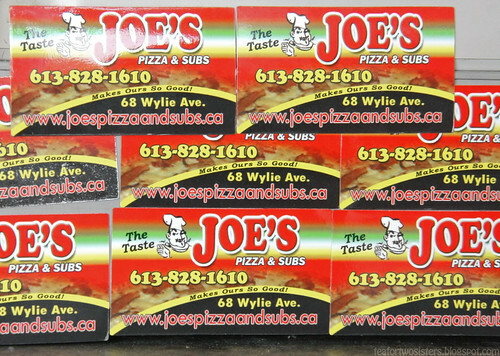 It might not be your favourite, but they’ve been around for three decades for a reason: Joe’s pizza is one of the best pizzas in Ottawa. Tennessy Willems, a small place on Wellington, is my favourite Neapolitan pizza in Ottawa. 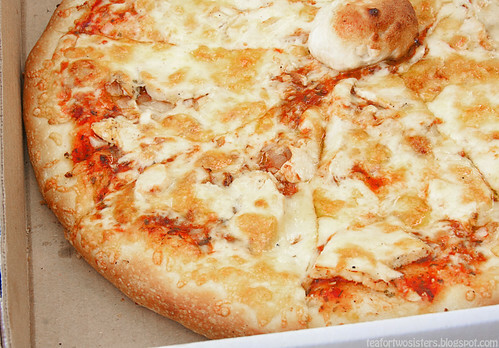 When I was in Toronto, I discovered that Pizza Nova makes decent pizzas. It's a shame I realized it too late. Pizza Depot fed my pizza cravings during most of the two years of living there. Disclaimer: This post was not sponsored. 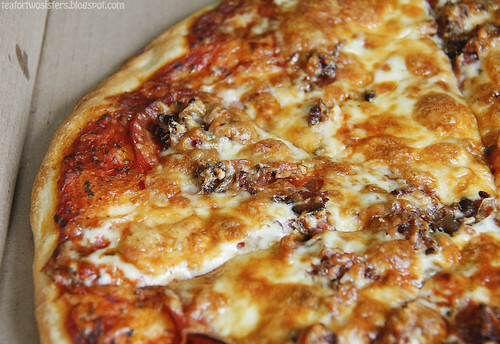 I received no monetary compensation for writing about Joe’s Pizza and Subs – though if anyone from Joe's Pizza and Subs is reading this, I’d accept your deliciously pizzas. ugh... Did they pay you to write this? Joe's pizza has terrible food, and even worse customer service. Look at the photos of what they sent me on urbanspoon (the poutine and salad). Absolutely grotesque. Hi Martman, I did not receive any compensation of any kind. We've been enjoying their pizzas since elementary school. We still enjoy their pizzas to this day. In regards to your comments about the poutine and salad; what do you expect from a pizza place? Whenever we order pizzas, we stick to the pizzas, chicken wings (occasionally), and soft drinks. And let's not lie, chicken wings you get at small pizza establishments are more than likely over-fried sad little dry things. It is beyond bad. There are great poutines, good ones, and bad ones... Then there are ones I wouldn't serve to my own dog. Joe's falls into the last category. In your view it is OK for a business to put food on the menu that is not up to standard? Because in my view, if it isn't good you shouldn't put it on the menu. Chef's need to have quality standards, anyone should believe that. Maybe he should just stick to pizzas and subs and take the rest of the stuff off the menu, that is my point. Your first comment stated that "...Joe's pizza has terrible food..." And that's your opinion. That's fine. How was the pizza you received, though? Was it also lacking? 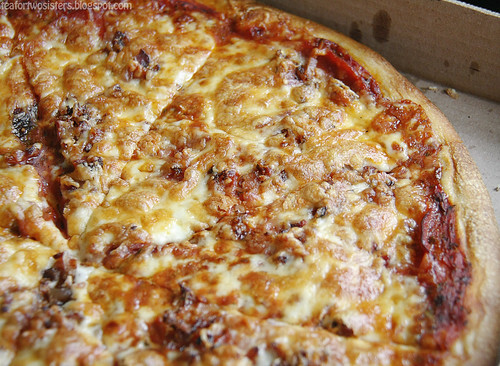 Finally, where do you get your favourite greasy pizza fix in Ottawa? I know I'm late wading into this discussion but as a long time Joe's customer I have some insight into this restaurant. There are really two Joe's Pizza places. One when Sam is working and the other when Dan is cooking. Dan makes an amazing pie but is only there evenings except Sunday and Monday. Sam is there during the day and the quality is not the same. Not the same at all. As for the poutine, I am in full agreement that it is hideous. Powdered gravy and shredded mozzarella does not make for good poutine. I only order the pies and only then when Dan is working. The difference is unfortunate. p.s. the worst poutine I ever had was made with shredded marble cheese and turkey gravy. In a just world you could be executed for that. The pizza that Sam made that day was good. Because we get our pizza fixes from various places, I don't know the dynamics at Joe's and can't differentiate between the pies made by Sam versus Dan. That being said, I have had some pretty fail pizza pies from Joe's before... Think of dense flat pizza shells that were reminiscent of the pizza shell stuff you can buy at grocery stores. I prefer to get it at a place that is known for their poutine when I want to eat poutine -- which isn't very often. Thanks for visiting and welcome to our food journal! We're two sisters from Ottawa, writing and photographing our delicious (and sometimes not-so-delicious) adventures. We want to make it feel like you were there with us, so the food might not always look photogenic. Do drop us a comment or send us an email! This work is licensed under a Creative Commons Attribution-NonCommercial-NoDerivs 3.0 Unported License. Images on this website cannot be altered, transformed, or reproduced in any way without written permission. All rights reserved. What Else Have We Eaten? Food in Mouth. NYC Restaurant Reviews. Dining. Streetfood. © Tea for Two Sisters 2013. All rights reserved.